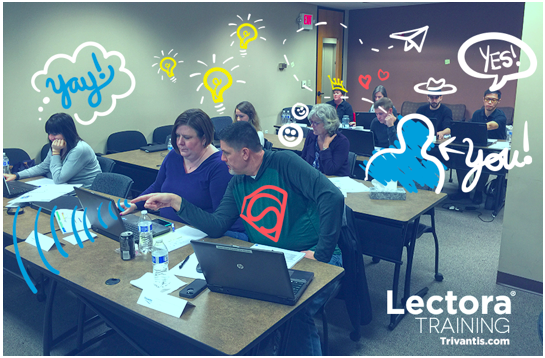 Train with the Trivantis experts—the folks who know Lectora best—so that you can polish your Lectora and Camtasia development skills and learn tricks from the pros. Learn the basics of Lectora Inspire, including an introduction to many of the menus within the application and the various object properties. In this class, build an eLearning course from scratch consisting of chapters, sections, pages, and a graded test. Include a variety of media within your title to engage learners and learn how to create basic actions (such as rollovers), navigation, customized buttons, and various question types. You will also learn how to publish a title to ReviewLink, a free online review tool, and to HTML for access via the Web. Please click on the specified location and date below to purchase. All sessions are conducted by Interactive Advantage. ...and some experience with User-defined Variables and conditional actions. Please click on the specified location and date below to purchase. All sessions are conducted by Interactive Advantage in Atlanta, GA.
Camtasia Studio 8 for Lectora is more than a simple screen recorder. In this training class, you’ll learn how to record on-screen activity to create professional-quality video tutorials; edit content with zoom and pan effects, callouts, and text; include interactive elements to encourage learner involvement; and produce and publish videos to a variety of formats including use within a Lectora title. Accessible e-learning is not only important to government agencies. It is becoming a vital aspect of a well-rounded diversity strategy for corporations and educational institutions. In addition to Section 508 compliance as mandated by the US government, this class also covers the WCAG standard for web content accessibility that meets the needs of individuals, organizations, and governments internationally. In this class, you will learn about the standards, how they relate to each other, and how they relate to your accessibility strategy. You will also leverage the Lectora features and development best practices to design, develop, and test your e-learning courses for compliance. The goal is to produce accessible courses that are robust, interactive and media-rich. Learn how to get started with the CourseMill Learning Management System. CourseMill training is only offered privately and can be delivered online or at your location. For more information, please email michael.darden@interactiveadvantage.com or call Interactive Advantage at (770) 945-9466. Send us an email to start chatting with an account rep.